Facts about Atlantic Mudskipper fish. "Scientific name for Atlantic Mudskipper fish is Periophthalmus barbarus". Atlantic Mudskipper fish is commonly referred to as mudskippers, common mudskippers or mudhoppers. The Atlantic Mudskipper fish can be found in the fresh waters and the salty marine water lakes and brackish water along the Central Africa, Congo River, West African coast, from Senegal to Angola, Cameroon, Congo Equatorial Guinea, Gabon, Gambiaand and on the islands of the Gulf of Guinea and many more in this range. Mudskippers are generally comfortable with almost all water environments. The fish tolerates both fresh water and marine water. The Atlantic Mudskipper fish, torpedo-shaped body, range up to about 12 inches (30 cm) long. The Atlantic Mudskipper fish has two dorsal muscular arm-like pectoral fins and they have a pelvic fin that is placed forward under the body, that act like legs, either partly or completely joined. Their muscular tail allows them to skip over land. Their broad high head have lateral lines on their foreheads are topped by large, buggy like budging eyes allowing the Atlantic Mudskipper to see both above and below water at the same time. When they are out of water, which is most of the time, they breathe with air trapped in their gill chambers as well as extracting oxygen from different parts of their body skin. The Atlantic Mudskipper fish is normally a gray and brown mud-color that camouflages them in their natural habitats. The Atlantic Mudskipper fish can be kept in aquariums. However, in the aquarium, the fish requires a place which it can crawl, skip on and climb. Without the requirements, the Atlantic Mudskipper fish can be noticed to be sticking on the glass, trying to climb up. The Atlantic Mudskipper fish can drown because it depends on the skin for gaseous exchange. Basically, wood and rocks can be stack up in smaller aquariums to create a habitat for the Atlantic Mudskipper fish. Unfortunately for large tank aquariums, the arrangement cannot work. Plant roots including some of the mangroves plants like roots can be added to the aquariums in order to provide refuge and habitat for the Atlantic Mudskipper fish. However, some other plants which enjoy humidity like the ferns plants can be grown in the upper parts of the tank aquarium in order to make the aquarium look natural although the process is not biotope specifically correct. 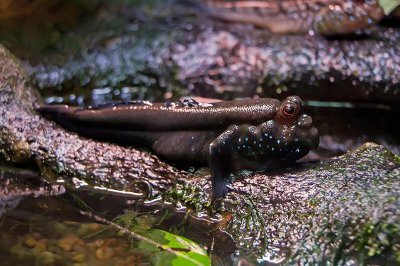 Unlike most aquarium fish, Atlantic Mudskipper fish have a higher tolerance for nitrogenous waste. For good fish keeping ethics, consider changing the water every month. An Atlantic Mudskipper is a carnivore and doesn’t mind mixing with other fish and is very peaceful in their disposition. While in the wild, the fish feeds on almost anything that they can get into their mouths. Some of the food products which the fish feeds on include small crabs, insects and the baby mudskippers alike. In captivity, the fish will thrive happily on most frozen and live foods. The mudskippers are also very comfortable with dry food diets. However, including some live or frozen foods from time to time is a great idea.,Features of the Atlantic Mudskipper fish.